Cygnus Knights (a.k.a. Knights of Cygnus in other versions) are a series of job classes. They use elemental abilities to their advantage and possess unique skills compared to standard job classes. Cygnus Knights began when the current empress of the Maple World, a young girl named Cygnus, sensed the evil Dark Magician lurking around the peaceful Maple World. Dark Magician is known for trying to destroy the Maple World, but he previously failed to do so. Now he has returned to once again wreak havoc. Empress Cygnus, aware of Dark Magician's actions, has begun to recruit brave Maplers to become Cygnus Knights whose duty will be to fight off the Dark Magician and his wicked followers. For more details on new characters, see #Noblesse. The old method of creating a Cygnus Knight required a player's character must be at least level 20 to create a new Cygnus Knight character. This new character, created to join the Cygnus Knights, will be connected to the main character who created it through a reward system. This connection allows the two characters to support each other through leveling. Each pair of Noblesse and Cygnus Knight will receive a buff called Blessing of the Fairy and gain an extra skill point whenever the other one levels up 10 times. Read the Noblesse section for more information. 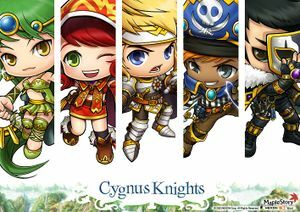 In KoreaMS, MapleSEA, TaiwanMS, and GlobalMS, Cygnus Knights are created in the same manner as standard characters, using the "Create A Character" style at the main page. KoreaMS's system no longer has any requirements (such as being level 20). The two highest level characters on the server acquire the Spirit's Blessing. There is no limitation to the number of Cygnus Knights you can create. In GlobalMS, the jobs are named differently compared to the ones in other versions of the game (Night Walker is the same in all versions). As well, the trainers for each job are slightly different. Stronger than the standard classes until standard classes pass their level cap. Gains 6 AP per level up until level 70. Exclusive map and quests in Ereve. Gets most skills earlier such as Echo of Hero (Level 120) and most 4th job skills (no need for a skillbook). Can use elemental abilities earlier than magicians. Gains a useful summon in 1st job. Gains their exclusive mount earlier than the standard class. Their level limit is 120 instead of 200. They can be expensive classes. Old system: requires that you have another character at level 20 or over. No class branches at second job like normal jobs. When you log into the game your character will have a light bulb above their head. If you click on it, it will automatically play a teaser video for the Cygnus Knights. Afterwards, you will be teleported to a map called "Cygnus Knights: Opening" where the screen will be black and Neinheart will ask if you want to teleport straight to Ereve. If you click "Accept" you will be teleported to Ereve, and if you click "Decline", the game will check if you have an empty character slot. Neinheart will then remind you that you are either full or you have room for a new character, and prompt you once more to teleport to Ereve (however it is bugged and so if you click "Accept", it will take you back to the same map you were on, which is the same effect as clicking "Decline"). The light bulb will once again appear, and you will have two new Cygnus Knights related event quests. If you happen to decline the free teleport to Ereve from Neinheart, you can still head to the island any time. Go to Ellinia (2 minute ride) or Orbis station (8 minute ride) and then take the ferry to Ereve for 1,000 Mesos (100 for characters below level 21). For more details on Noblesse skills, see ../Noblesse/Skills. KoreaMS (KMS): at the character creation screen, just choose "Cygnus Knight" (the first option), and off you go. This will use up one of your three character slots. 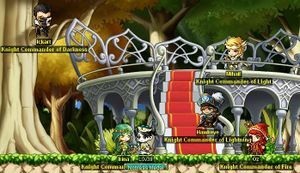 MapleSEA: MapleSEA users can create a Cygnus Knight the same way that is used in KoreaMS. GlobalMS: GlobalMS users can create a Cygnus Knight the same way that is used in KoreaMS. For more details on Cygnus Knight quests, see MapleStory/Cygnus Knights/Quests. Once you start your Cygnus Knight, you appear in Ereve. New characters are equipped with the same basic equipment as a Beginner on Maple Island. By questing, players can acquire a hat, an overall, and a medal which identifies them as a Cygnus Knight. Quests in Ereve are simple, just like the quests in Maple Island, but are required to get the first job advancement (meaning that you must complete all of Kiku's quests if you want to advance). Put all of your AP into STR. This will help you swing your way to first job. Put all of your AP into INT. This will maximize the amount of MP that your character will have, which in turn, allows for more frequent use of skills. Note: After certain UI updates, allocating your AP as a Noblesse becomes unnecessary, as the stat screen does it for you. If you want your character to have the upper hand in the future, you should pump up your INT. A lot of people that are used to regular classes will say that's bad, because it will make training slow. However, the Three Snails skill is extremely useful for Noblesse. If you have your INT pumped up, you will have more MP to consume when using Three Snails. The skill does not require you to carry snail shells, so you are not limited to training on certain monsters. Also, level three Three Snails deals 40 damage, which is high enough to kill most of the monsters on the island in two hits. When you finish the second available quest you will be rewarded with the Fine Noblesse Robe. You can use this to replace the two piece armor set you started with. If you go to the weapon merchant Kiriyu, you can sell the two pieces for 50 Mesos. With the 50 Mesos, you can purchase a slightly more powerful weapon (17 damage for Sword and Axe, and 19 for Wooden Club; but remember that swords gain a larger bonus from Strength). Mihile to become a Dawn Warrior. Oz to become a Blaze Wizard. Irena to become a Wind Archer. Eckhart to become a Nightwalker. Hawkeye to become a Thunder Breaker. This page was last edited on 23 August 2013, at 17:20. This page has been accessed 218,602 times.